Many blogs ago I wrote about my friend David and his velomobile concept. Well…after too much time, he finally came back to S.F. to visit. And he brought his sister, Sarah, along. It was an awesome several days of microbrews, cycling, and business ideas. 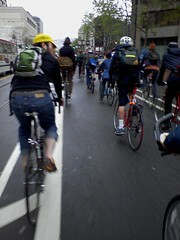 Here’s a picture of David (in the yellow cap) in this month’s critical mass. It was pretty wet out this month, but the dedicated few were still out. We stopped afterward at bar called Gestalt. It’s become a favorite Mission destination of mine because of the indoor bicycle parking and Steins of beer. Well, it turns out that Steins of beer, wet roads, and fixed gears can be hazardous. I’m not quite sure of the sequence of events, but I ended up taking a spill on the way home and somehow didn’t even react to the fall. David and Sarah – Thanks for coming to visit! I felt like the guest the entire time.